I can never seem to find accurate measurements of interior, and don't care much for over-estimating when ordering product or coming up short. Went ahead and took some rough and conservative measurements of the interior and added them up. Not that these measurements cover floors, roof, "trunk" space, doors and firewall, but do NOT cover the rear quarters. I did my best to measure things not accurately per se, but conservatively. Leaving room for error and extra material. Here's a sheet where I did my rough sketch. Not that I assumed the doors were square from their largest measurements, which I tried to do for everything. I included the transmission hump as part of my floor measurements. Everything was estimated on the high end. Total estimate after converting sq in to sq ft was 65 sq ft. Does that sound right? Some other threads I've read have said used over 100! Have I done some measurements wrong or is this just because of the wasted material from cut and stick types of insulation? I think 75-80 sq ft would be fairly accurate to cover a portion of the wheel wells and quarters. I used the Lizard Skin Coverage calculator and came up with 3 gallons of ceramic insulation and 3 gallons of sound control. Price total is close to $500 without their applicator. If I got this route, thankfully @jpndave is close and has used it before. For the cost of that much material, I'm definitely leaning towards just insulating with the ceramic heat material to cover everything, then down the road using the Dynamat Dynalite or another semi-lightweight, but much cheaper alternative to the LizardSkin Sound deadening. You can come to your own conclusions of what materials will be most cost effective for you based on these rough measurements or the estimates others have given of as high as 100sq ft or more if you're not being very careful about how you cut the mats. If you use lizard skin, go to the dollar store and get a few rolls of the cheap aluminum foil to foil the holes. Prep takes a while, but it only takes minutes to spray the car. The nice thing is, you can cover everything. I did my Z with lizard skin, and my previous car with dynamat. I much prefer lizard skin for performance, ease to apply (the dynamat sucked to apply), and weight. Dynamat is heavy stuff. I'll second that comment on the Lizard Skin being a superior product. Even though the sound control is heavier than the regular ceramic version, it's MUCH lighter than any applied mat. My Jeep has 8 layers in the tub, 2 Sound Control and 2 ceramic on each side. Pretty much no sound and minimal heat through the body most everything comes in around and through windows, etc. Doors though fairly "tinny" stock now "thud" like a luxury car when closed and might be 1lb. heavier. My Z will only get the ceramic because it's light as a feather while still providing a great deal of sound and all of the heat insulation. But I'm being overly cautious on weight with it. If you can handle a few lbs, the SC does help out more in that department. Not bad to install and I have the gun so you can just do it here and save that cost. Pretty Sure I have 4 gallons of the ceramic that should be good, need to check that out today. Nice seeing you yesterday. Glad those coilover turned out so nice. Oh, there are cheaper places to get the Lizard Skin. I'll look up my sources. I think I used like 12 gallons in that Jeep. 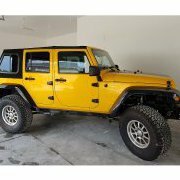 I bought the additional 4 for the hardtop which I sold because they came out with a soft top that had glass windows, defrost and wiper. Checked multiple dealers they had as well as amazon. Jegs seems to be the cheapest from what I've seen. Some guys on the jalopy forums who have lots of experience with it on multiple vehicles seem to say that it covers more area than they claim. @jpndave, I'll definitely take you up on using the stuff you have and buying you new stuff when I figure out how much it covers. If the interior really is this much smaller than some people have said, I might end up using only 2 gallons of the ceramic to get the right coating. Regardless, your 4 gallons will be more than I need and I'll happily order you a new batch of however much I end up using. The Z interior is pretty small for just inside no way it goes over 4 gallons. We can always lay it on a little thicker with multiple coats to get a bit better sound/heat control. It's not that expensive and super lightweight. Zetsaz: did you end up doing the lizard skin? And if so how much did you actually use? I’m doing both ceramic and sound deadening so would like to get a somewhat accurate idea of how much to buy. I have a credit with Jegs so I’m sure that’s where I will purchase mine at this point. Also, are you happy with the results! ?